This post is Part 4 of a series to augment the Guest Resources available for free download. Start with Part 1 here. This and other guest-inspired content is gathered in my Guest Directory for you to explore. Find more tarot resources in my Tarot Directory. In Part 1 of this series, I collaborated with historical fantasy author Linnea Tanner on this guest post for her Celtic history blog. I originally wrote this piece in April 2015, and it has been reposted here with permission. It is with great pleasure that I introduce D.N.Frost, an exciting fantasy author with a passion for Celtic mythology and traditions. She has graciously provided a guest post about the rich symbolism of nature used in tarot cards. Welcome D.N.Frost! I encourage everyone to learn more about her and the epic saga Tales of the Known World. 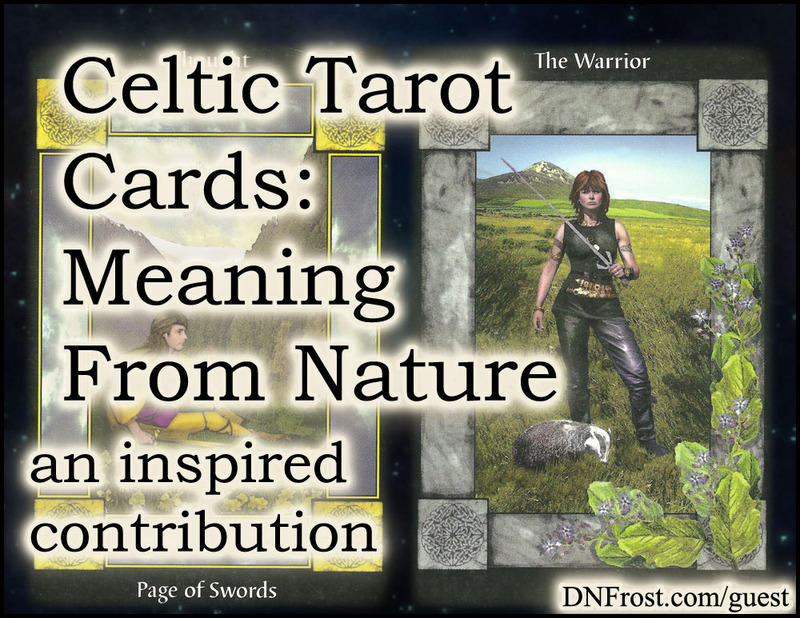 The world of the ancient Celts teemed with layers of meaning and symbols drawn from nature. Many of these assorted myths and traditions were amassed in detail by Anna Franklin, a well-known Celtic Pagan authority in the British Isles. One of her books accompanied a Celtic-themed tarot deck, and though tarot only dates back to the 15th century, the book and cards are steeped in ancient Celtic heritage. 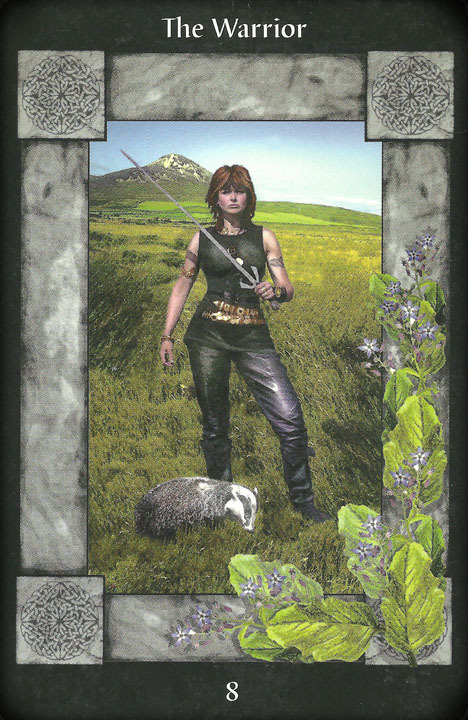 This card depicts Scathach, a legendary Celtic warrior woman. At her feet, a badger appears as the warrior’s familiar, and from the corner grows the magical herb borage. The name for this plant arose from the ancient Gaelic word borrach, meaning “a brave or courageous person.” Celts often soaked borage leaves in wine, which elevated adrenaline levels to evoke power and courage. Renowned for her skills and strength, Scathach ran a school for warriors in her fortress on the Isle of Skye. Her name meant “the shadowy one,” and her fortress was known as Dun Scaith, the “Castle of Shadows.” Scathach only trained the adept few who were brave enough to invade her fortress and entreat her tutelage within. Check out these Guest Resources for more inspirational content! She was most renowned for training Cuchulain, the hero of the Irish Ulster saga. Though she is pictured with a sword while preparing for the Lughnasa games, Scathach is best known for the barbed spear Gae Bulg, which she gave to Cuchulain after he completed his training. Some tales accredit Scathach with the power of prophesy, a gift often attributed to ravens. For ancient Celts, the badger was regarded as the best familiar for the warrior’s intrepid spirit. Seen as unshakable and grounded, the indomitable badger inspired the path of a warrior with its courage and ferocity. The Celts believed that the badger knew all the secrets of Albion, and that its knowledge arose from the depths of the earth in which it dwelt. The badger taught many lessons to the ancient Celts, including the importance of seeking inner solitude. 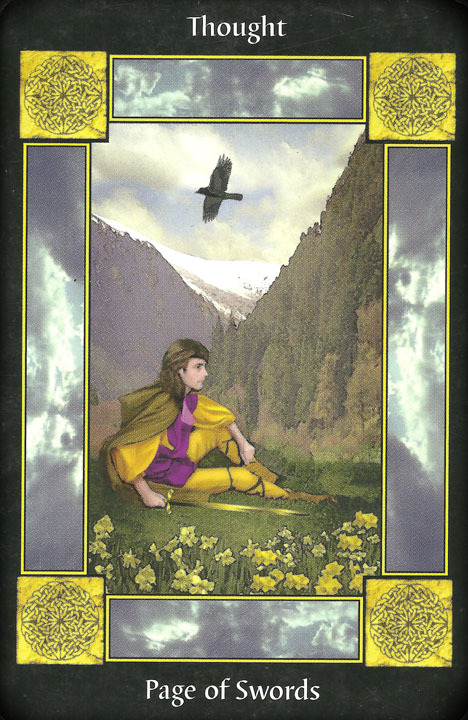 This card depicts a raven circling the cloudy sky over a youth lost in thought. In the surrounding mountains, tall pines stand as the tree of heroes and warriors, and swaths of bright daffodils paint the springtime valley. This flower symbolized the instinctive sexual energies of spring, sweeping the earth in magical regeneration. In the Celtic tradition, pine trees symbolized fertility and rebirth, representing the vivacious spring rather than the desolate winter. Pine was one of the chieftain trees in the ancient Ogham alphabet, and its sturdy spirit especially resonated with Northern Celts and heroes like the warrior Scathach. Ravens were messengers from the Celtic gods, bringers of wisdom and guidance from another plane. For the Celts, ravens were teachers and protectors, especially for seers and spirit warriors. Because they often circled in storm clouds, ravens were said to be thunderbirds that could herald coming squalls. Ancient Celts viewed ravens as prophetic, and their behavior was often used to auger the outcome of battles. According to legend, the foresight of ravens warned the Irish god Lugh of the Formorian invasion. The head of the Celtic god Bran, whose name means “raven,” was said to prophesy from White Mount, the future site of the Tower of London. Bran’s head protected Britain from invasion until King Arthur removed it to demonstrate his own dominion over the land, but ravens still roost in the tower. Legend has it that Britain will fall to invaders should Bran’s ravens ever disperse. 1. Anna Franklin, The Sacred Circle Tarot: A Celtic Pagan Journey; Llewellyn Publications, 2000. 2. Paul Mason, The Warrior; Mixed media illustration. Sacred Circle Tarot: A Celtic Pagan Journey; Llewellyn Publications, 2000. 3. Paul Mason, The Page of Swords; Mixed media illustration. Sacred Circle Tarot: A Celtic Pagan Journey; Llewellyn Publications, 2000. You can download Guest Resources here, or start your adventure below.